When we were growing up, bread was often a side at our dinner table, whether it was just plain slices of white bread to soak up gravy, or dinner rolls or a savory quick bread. 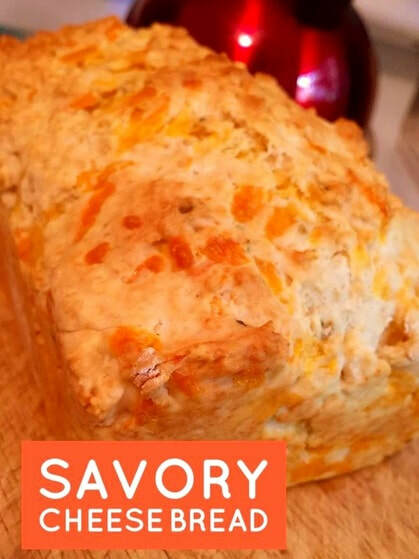 Here's a great savory cheese bread recipe that is so easy to make! Mix together the dry ingredients and the cheese in a large bowl. In another bowl, combine the milk, egg and butter. Mix well. Add the wet ingredients to the dry, a little at at time, being careful not to over mix. Spread the batter (it'll be thick) into a greased 8x4 loaf pan. Bake for 40-45 minutes at 350F. Cool for about 10 minutes before removing from the pan.